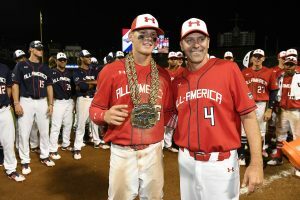 For the eleventh straight year, the nation’s best high schoolers gathered at Wrigley Field in Chicago for the Under Armour All-America Game. 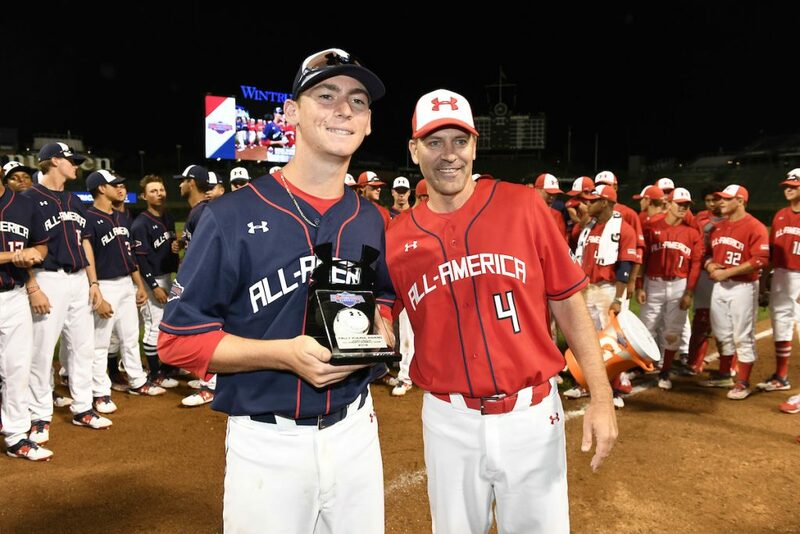 This year’s matchup between the American and National Teams, included a great mixture of big time arms on the mound, power at the plate, and speed on the bases. That being said, the American Team came back from an early 2-0 deficit, scoring eight unanswered in an impressive 8-2 victory. 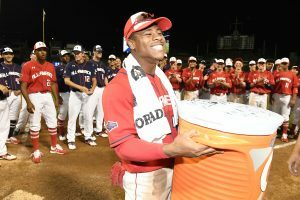 They were led by INF and MVP Bobby Witt Jr who walked twice, was hit by a pitch, and delivered a huge three run home run in the top of the ninth to seal the victory and win eventual Most Valuable Player honors. In terms of other awards, Derek Diamond was the Kelly Kulina winner, and Jerrion Ealy won the Gatorade G Award. The winning pitcher was Riley Cornelio and the losing pitcher was Matthew Allan. The Cary, IL native had a relatively clean inning allowing a single to Ethan Hearn and also had a runner get on via error, but was able to work out of the jam. He threw nine of 16 pitches for strikes and struck out the last hitter of the inning to retire the side. In the bottom of the first inning the National Team came out swinging. CJ Abrams smoked a leadoff double over the left fielder to kick off the inning. 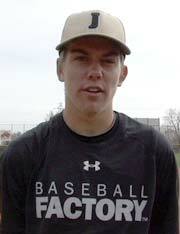 Riley Greene then went on to crush a two run homerun to right field with one one out in the inning. This put the National Team up 2-0. Espino showed off his electric arm, topping out at 99 MPH. Barco was dominant on the mound as he struck out two batters in his one inning of work. Cornelio pitched a quick one, two, three inning, including one strikeout. Corbin Carroll turned on a pitch for a double to deep right field, giving the American Team their first extra base hit of the game. A hit by pitch and a walk then loaded the bases with only one out. Allan was then able to induce a ground ball back to himself, in which he flipped home. However Logan Britt then worked a two out, bases loaded walk to put the American Team on the board. Just a couple of pitches later, Gunnar Henderson ripped a two run single through the infield to give his team a 3-2 lead. Rigney walked OF Chris Newell, but then quickly picked him off. Besides this it was a clean inning. The son of former Major Leaguer Al Leiter, Jack allowed two baserunners but was able to strike out the side. Andre Tarver hits a double on a full count to start off the inning. Bobby Witt Jr was hit by a pitch, but then thrown out at second trying to steal. Jerrion Ealy then extended the American Team’s lead with a single up the middle. Thompson fired a clean three up, three down inning for the American squad. This consisted of two ground balls and one strike out. Myles Austin worked a one out walk and then flashed some speed as he went from first to third on a ground ball to short. However Jud Fabian robbed Newell of an extra base hit with an excellent catch against the ivy to end the inning. SS Anthony Volpe turned an excellent unassisted double play and then Childers got a huge strikeout to keep his team on top. Tarver led off the inning with a walk, but catcher Matt Carpentier threw him out as he attempted to steal second. Mederos ended the inning with a strikeout. Another three up, three down inning for the American Team as Jones struck out one. Carroll and Barco worked back to back one out walks, but Rivera then struck out Austin and Tyler Callihan to strand the runners. Abrams collected his second base hit of the game with a one out infield single. After a two out walk to Greene, Short struck out Rece Hinds to send the game to the top of the ninth. An error and a walk began the inning, leading to an RBI single by Tarver. Witt then worked the best at bat of the night as he fouled off five full count pitches before launching a three-run homerun to left. Short returned for his second inning of work on the evening and dominated as he struck out two. This claimed the victory for the American Team.